Here at Chemstore we are offering 10% off list price for this “16DSD walk in” store this month. This bunded store has overall dimensions of 6000mm (L) x 1600mm (W) x 2550mm (H). This store which is designed to hold up to 4 pallets, 16x200L drums or 4x1000L IBC’s stored on 1 level is fitted with 650mm deep shelf along rear wall which is ideal for small, 25L drums. 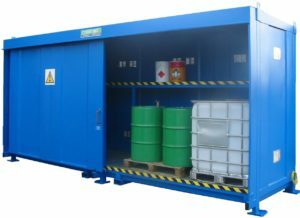 Just like all of our stores here at Chemstore this store is issued with “Bund Test Certification.” The 1500 litre capacity of this unit exceeds EPA & EA regulations that state the bund capacity should be a minimum of the 25% of the total volume stored. This all steel store comes with fully galvanised decking for pallet or loose container storage and for easy personnel access. This “16DSD walk in” unit is fitted with Twin sliding doors running on heavy duty slide mechanism. The doors are fully padlockable to ensure maximum safety. The unit is fitted with high & low level louvers ensure airflow throughout the store. Unit is fitted with forklift channels and roof-fixed crane lifting points to allow for easy unloading and relocation if required. Please do not hesitate to get in contact with one of our sales engineers today for more information on this fantastic offer.